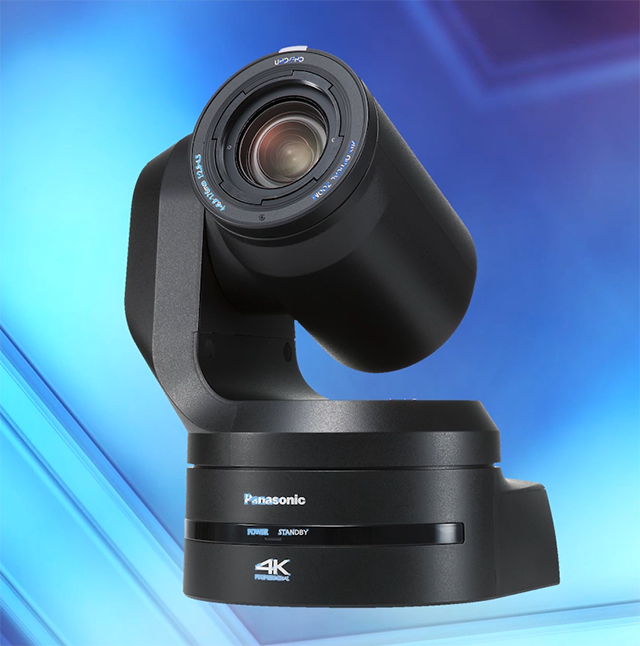 In this review, I’ll look at a new 4K broadcast production setup from Panasonic that combines the AW-UE150 PTZ camera, the AW-RP150 remote controller, and a BT-4LH310 4K production monitor (Figure 1, below). I’ll demonstrate some of the key features of the AW-UE150, and what sets it apart from other broadcast PTZ and remotely operated camera gear. The AW-UE150 (Figure 2, below) is large and heavy, but it's meant to be permanently installed in a dome or somewhere up on a stand. It comes with a safety cable, which you would always want to use no matter how you install it. But the safety cable is extremely important if you're going to mount it in another way, outside of just a tabletop or flat surface. You can mount it on a wall, or you can mount it inverted and flip the image. You can also change the control settings on the RP150 so that the controls are inverted to match what your image looks like if you have the camera mounted upside down. It offers control over CAT-5 and CAT-6 network cable. It takes a standard four-pin power in. 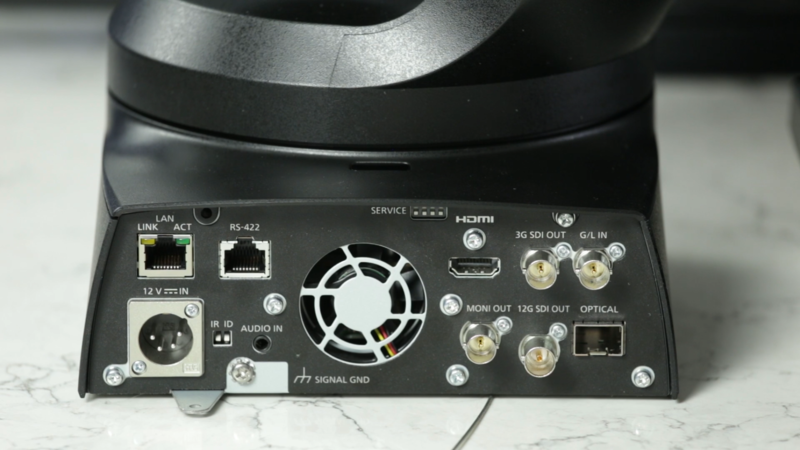 And it offers both SDI and HDMI out (Figure 3, below). It also offers some fiber options if you need them. Let’s take a look at the RP150 (Figure 4, below), the star of the show in this setup. This is where all the magic happens. You have all your basic controls: zoom, focus, iris. You also have tilt and pan on your joystick, which I've found to be extremely comfortable and easy to use, and then you have a series of sections of buttons. On the top left in Figure 4, you can see all the camera control buttons. In the bottom center, you have camera groups, or camera numbers, so you have 20 banks of up to 10 cameras each that you can control. 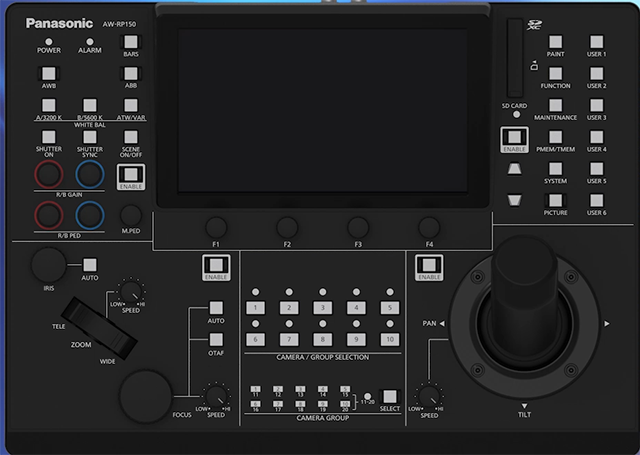 And then on the right, you have more of your function buttons for controlling presets, controlling operations within the menu system of the camera. The great thing about this newer RP150 is the fact that it has an all-touchscreen large color display (Figure 5, below). So there are many things that you can do that you can either use the screen for, or use a function button that’s below the screen. I like the idea of having both the touchscreen and physical buttons, because sometimes the buttons are a little too sensitive and they’ll skip past the option you’re trying to land on, so it’s great to be able to just tap on the screen for the exact option that you want. The RP150 offers both picture memory and tracing memory. Think of picture memory like setting a keyframe: lt recalls all of your settings for a very specific shot, and it goes right to those settings. There’s no zooming, panning, or tilting going on when you press that button. It just gets to the point and holds there. Tracing memory is more powerful, because it actually records a move. If you're working in After Effects with a series of keyframes, with tweening between the keyframes, it can actually follow exactly what you did, record it, and then play that back and show you exactly what you did at the same speed. You can recall multiple tracing and picture memories in the RP150, and just recall them with the push of a button. 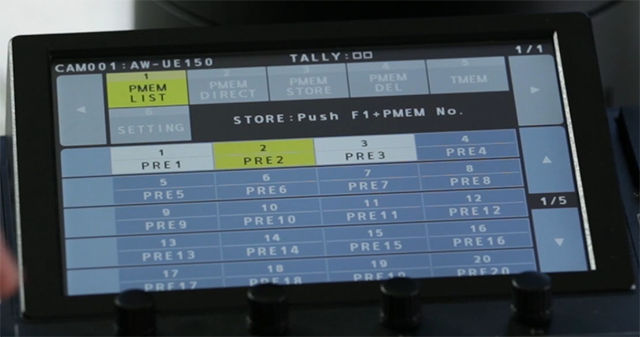 You can tell the RP150 is designed for a fast-paced production environment. There are enable buttons in each section of buttons. That prevents you from accidentally pressing a button, or changing a setting unexpectedly. The other great thing about the display on the RP150 is, whatever camera you have selected, it shows the parameters that are set right on the screen. If I were to switch to another camera, it would immediately update the display and show me all the camera settings that are on that particular camera. Panasonic has really thought through this system well. They’ve put everything right on the screen or right on a button, so it's easy to get to. So if you're a broadcaster and you're looking to upgrade to 4K, or you just need to add to your arsenal, consider the Panasonic PTZ system discussed here.